Providing more security and convenience to drivers and car manufacturers and enabling new business models for rental or car sharing services. In the quest for intelligent mobility, more and more car manufacturers are enabling their customers to connect to their vehicles via a smartphone app. This may allow the driver, for example, to remotely locate the vehicle, open it or check driving statistics. The user obtains a digital key for the vehicle that can also be shared with others. That means, however, that a user who paired their smartphone with the car, becomes it’s factual owner – even if it is not on legal grounds. This poses the risk of third parties taking control of a vehicle without revealing their identity. Also, the ability to verify and authenticate the identity of authorized vehicle users and to exchange and revoke keys opens up many new opportunities – for example when combined with payment information. Therefore, strong user verification and secure pairing are indispensable requirements for the future of intelligent mobility – but are missing at the moment. Customer identification with ​Keyp​ provides more security and convenience to drivers and car manufacturers and enables new business models for rental or car sharing services. The ​Keyp Identity Terminal​ allows car manufacturers to introduce new customers to the system at any time and any touchpoint in the buyer’s journey. A customer might, for example, verify their identity through the car makers proprietary app shortly before vehicle delivery using their ID or passport and video identification. The car is then paired to the specific user by scanning the vehicle documents and reading out the unique Vehicle Identification Number (VIN). From then on the new car owner is able to share or revoke digital keys and limit access for certain users, such as family members under the legal driving age. The identity information and vehicle ID stored in the user’s ​Keyp Wallet​ can also be used to subscribe to an insurance policy online or in a retail location. The onboarding is done with a few clicks and a biometric authentication by swiping the screen or carrying out a face recognition process. Additionally, new opportunities for mobility solutions arise from adding a verified driver’s license and payment information to the ​Keyp Wallet​. Users can connect with rental or car sharing services with a single tap. By scanning a QR code or touching a NFC token on a rental car, the identification and authentication process is triggered. ​The rental or car sharing service receives an immediate confirmation and provides digital keys to the vehicle. For additional security and fraud prevention another in-car-authentication is required. 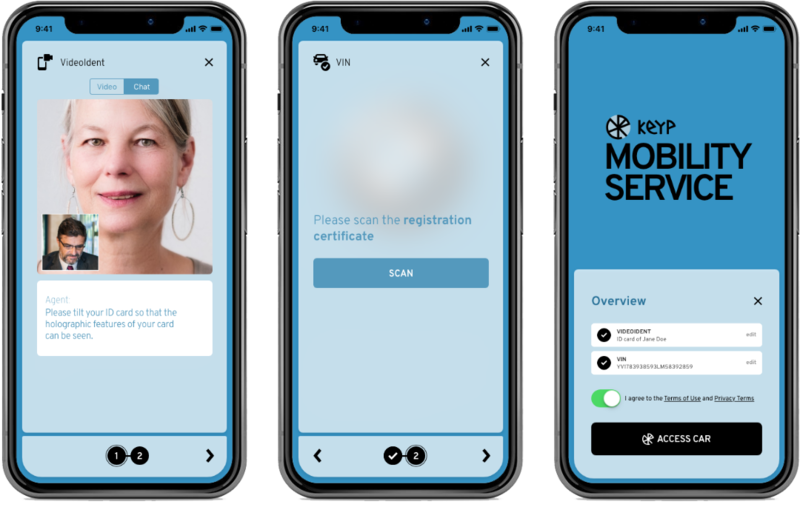 This way, customer identification for mobility services with ​Keyp​ enables new business models, provides greater security and convenience to drivers and vehicle manufacturers as well as rental or car sharing services ​ – anywhere, anytime.